Summertime conjures up images of backyard barbecues, pool days, and, above all, long-awaited vacations. Kids are out of school and work is (hopefully) a little slower, so it’s a lot easier to slip away from real life to recharge your batteries and reconnect with family and friends. But when life gets in the way, vacation planning can go by the wayside and it can seem impossible to start the process as summer approaches. If you haven’t planned a vacation for yourself and your family this year, it’s okay. There are plenty places you can go to have a fun, relaxing time. It goes without saying that booking vacations last minute can have pretty high costs associated and that it’s a huge deterrent to summertime spontaneity. But, while it could cost you a pretty penny, we’re here to tell you that you don’t have break the bank in order to get some much needed rest and relaxation. And once you start the planning process, you’ll be able to see how easy, and affordable, it can be to plan a last-minute vacation. Below you’ll find tips on how to plan your next spontaneous vacation with ease. Check them out and let us know what you think in the comments. Happy planning! We know what you’re thinking – how will you be able to afford the last-minute rates? It’s a huge concern for many would-be travelers and it’s one of the biggest reasons why people spend summer vacation on the couch. But, travel doesn’t need to be expensive. Use this time to think about what you can afford and as you begin looking into vacation travel, set a budget for yourself. Whether you want to plan a small getaway or go all out for your dream vacation, think about how much money you are able to spend. Are you only going to rely on the money you have available in your bank account? Or are you able to spring for something a bit more extravagant by dipping into your savings or acquiring any unclaimed money? No matter what, remember you financial goals and only do what you can afford so you can go on the vacation you deserve. Another reason why people tend to shy away from spontaneous vacations is simple – they don’t know where they can go that’s budget friendly, easy to get to, and has fun things to do. And while this is a valid concern, you can go on an affordable, last-minute vacation whether you are a beach bum, a mountain dweller, or somewhere in between. You just need to figure what you can afford, how long you can be away, and how you plan on getting there. Road trips are a great way to go explore a nearby destination for relatively little traveling costs. If you want to go a little farther than driving distance, there are several low-fare airline options that can take you anywhere across the country for a great price. Along with that, hotels and rental-property owners often have last-minute deals to avoid having an empty room during a lucrative summer weekend. You can save even more by cut traveling expenses completely and planning a staycation. You chose to live in your city for a reason, so it only makes sense to stay put and make the most of it. With this option, you can be tourist in your own city. Book a hotel (or ever stay home! ), go around to all the local hotspots, and prepare to fall in love with your city all over again. 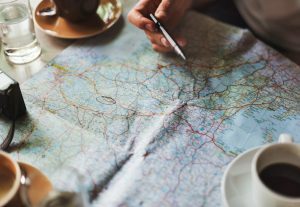 The possibilities are endless for your next destination, you just have to start planning, which, of course, can be easier said than done. Once you have your budget set and your destination picked out, it’s time to start planning your vacation. Once you do start planning, however, it can start to get time consuming and costs can start piling up, which is the main reason why most people opt out of last-minute vacations in the first place. The good news is that you don’t have to plan everything on your own. You can book your last-minute vacation by going online and using discount travel sites or getting in contact with a travel agent and having them book your trip for you. With either option, you’ll be able to get all the best deals available to you during your vacation window. On top of that, you may be able to find local treasures or pop-up events, that you might not have been able to find on your own. With a little help, you can plan your perfect, and budget-friendly, weekend from start to finish quickly and easily. With summer just around the corner, it’s the perfect time to start thinking about taking some much needed time off, hitting the road, and going on vacation. Don’t worry if you haven’t planned anything – there are plenty of destinations where you can have a great vacation without breaking the bank.